Sussex is the cocaine capital of England and Wales, with police seizing more of the drug per person in the region than in any other area across the country. But new figures from the Home Office show drug seizures have dropped in recent years, with the Police Federation warning that officers do not have the resources to effectively combat drugs. Sussex Police seized 23kg of cocaine between April 2017 and March this year, in 1,105 seizures. The rate of 653 seizures for every million people in the area was the highest across England and Wales’s police forces – ahead of Cleveland, where there were 449 seizures per million. Numbers from the City of London, where many work but few live, have been excluded. Altogether, there were 5,493 drug seizures in Sussex in 2017-18. The most commonly confiscated drug was cannabis, with 9,356 plants, 129kg of herbal cannabis and 77kg of cannabis resin seized. Anabolic steroids (12,647 doses) and benzodiazepines (9,721 doses) were also confiscated in large quantities. Drug seizures have dropped by 27 per cent since 2007-08, when they peaked in Sussex. The Police Federation of England and Wales said erosion of stop and search powers were hampering the fight against drugs. A Sussex Police spokesman said: “Sussex Police, working with the Metropolitan Police and the Home Office, were the first force in the country to use a new law aimed at curbing the use of phone lines by organised crime groups to distribute drugs. “The force works closely with law enforcement partners, including the National Crime Agency, the South East Regional Organised Crime Unit, British Transport Police and neighbouring forces, to deal with the known threat of drug dealing stemming from London. “This is not a new phenomenon. London affiliated gangs have been seeking to establish drug distribution in East and West Sussex and elsewhere in the South East, for several years. “The areas in Sussex most affected by the drug trade from London are the larger coastal towns, with established drugs markets that can be exploited locally, namely Hastings, Eastbourne, Worthing, Bognor Regis and Brighton, but also towns such as Crawley. “We actively target such drug dealing on a forcewide, divisional or district basis wherever it is identified and there have been many examples of successful disruption and convictions of dealers. 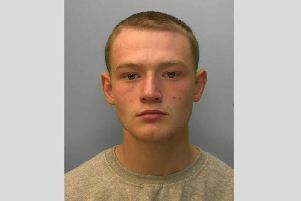 “Anyone who has suspicions or information about drug dealing in their community or wider afield can contact the police at any time online – https://sussex.police.uk/contact-us/report-online/ – or by phoning 101.